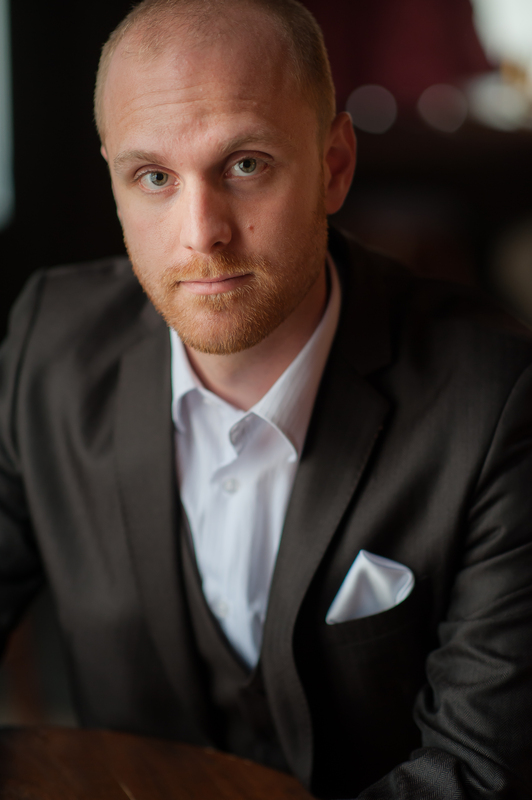 Baritone Geoffrey Sirett has emerged as one of Canada’s finest young baritones, and is highly sought-after across the country for a wide range of operatic and concert repertoire. His charisma as an actor and a singer make him an ideal choice for the leading role in the world premiere of OVERCOAT, a musical version of the stage hit presented by Vancouver Opera, CanStage and Tapestry Opera in the spring of 2018. This season also includes his debut on the Four Seasons Centre stage in the Canadian Opera Company production of ARABELLA, the role of Captain Corcoran in Edmonton Opera’s H.M.S PINAFORE, and Weill’s SEVEN DEADLY SINS with the Toronto Symphony. During the summer of 2016, Sirett returned to Nova Scotia for a repeat of the hit production – THE BELLS OF BADDECK – followed closely by a Banff workshop for the Toronto Symphony’s presentation of SEVEN DEADLY SINS. In 2016-2017, he also appeared as Oreste in ELEKTRA and Ping in TURANDOT for Edmonton Opera, ELIJAH for the Pax Christi Chorale, MESSIAH for the Newfoundland Symphony, Beethoven’s MISSA SOLEMNIS for the Grand Philharmonic Choir and an appearance with the Bach Elgar Choir of Hamilton. Highlights of the 2015-2016 season included Beethoven’s SYMPHONY No. 9 (Orchestre symphonique de Drummondville), Bach’s B-MINOR MASS (Sweetwater Festival), Mussorgsky’s SONGS AND DANCES OF DEATH (Off Centre Music Salon), THE MERRY WIDOW (Edmonton Opera), DAMNATION OF FAUST (Calgary Philharmonic), PRINCE IGOR (VOICEBOX: Opera in Concert), Bach’s MASS IN B MINOR (Ottawa Bach Choir), and a Candlelight Christmas Concert (13 Strings Chamber Orchestra). Geoffrey’s 2014-2015 season included over 70 performances across Canada, highlights of which include John Adam’s THE WOUND DRESSER (Victoria Symphony), Brahms’ REQUIEM (Ottawa Bach Choir), Purcell’s DIDO AND AENEAS (Theatre of Early Music), Handel’s MESSIAH (Winnipeg Symphony) as well as performances with the Talisker Players, Canadian Art Song Project, Orchestra London, Winnipeg Symphony, Victoria Symphony, and Nota Bene Baroque Orchestra. Appearances on the opera stage included Opéra de Montréal’s production of Kevin Puts’ SILENT NIGHT, Wolf-Ferrari’s IL SEGRETO DI SUSANNA with Opera5, and the world-premiere of MacDonald/Burry’s THE BELLS OF BADDECK. The premiere of James Rolfe’s OPEN ROAD, Brian Current’s AIRLINE ICARUS, Pergolesi’s LA SERVA PARDONA, Dean Burry’s THE BROTHERS GRIMM, Bach’s JOHANNES PASSION, Mozart’s KRÖNUNGSMESSE, Stankar in Verdi’s STIFELLIO, Bach’s WEIHNACHTSORATORIUM, and MESSIAH are works he has performed for Soundstreams, Against the Grain, Canadian Opera Company, Ottawa Choral Society and Choeur St. Laurent. DON GIOVANNI, LE NOZZE DI FIGARO, COSI FAN TUTTE, HANSEL AND GRETEL, ORLANDO, CANDIDE, IL MONDO DELLA LUNA, PAGLIACCI, DER KAISER VON ATLANTIS, GIANNI SCHICCHI, ALBERT HERRING, A MIDSUMMER NIGHT’S DREAM, WEST SIDE STORY, and THE GREAT GATSBY are operas in which he has been featured.